Cartoon Sara and Tiny Doom have joined forces for total juggernaut of a post! 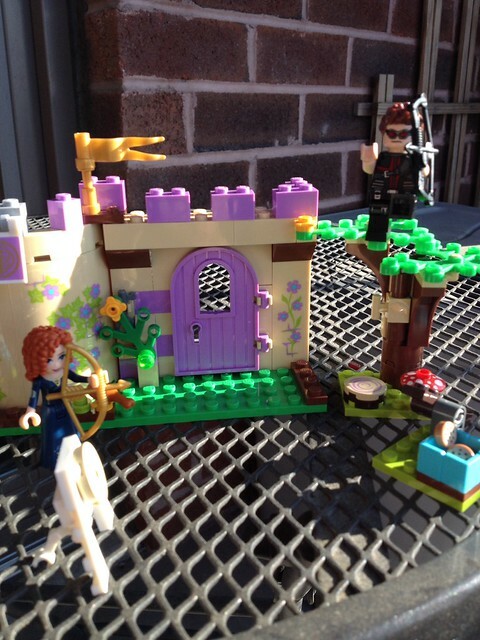 Lego+Disney+Princesses! Will the blog survive? Eh, probably. 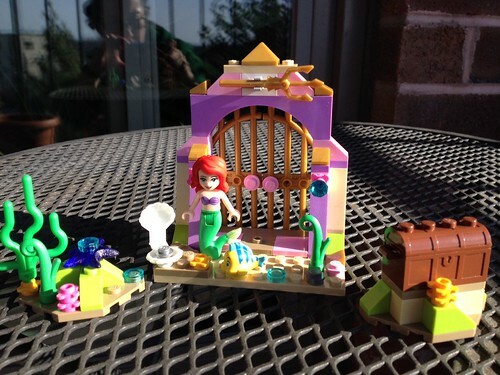 Below we review 2 of the Lego Disney Princess sets (we skipped Cinderella's Castle,Ariel's Magical Kiss and Rapunzel's Captivity, er...Creativity Tower). 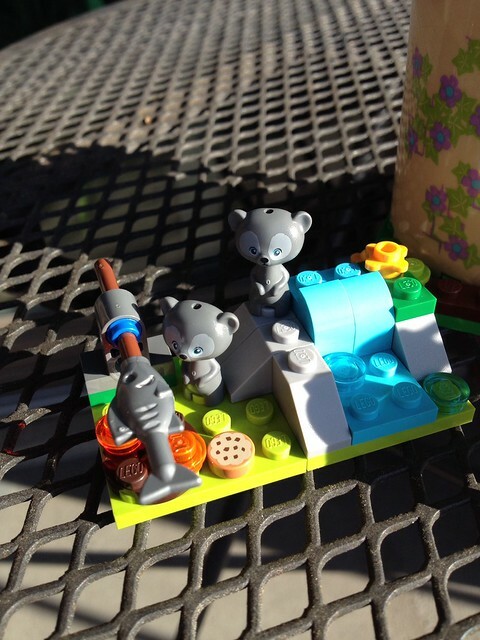 Tiny Doom: My perspective on the Lego “Friends” line has been a long time coming. And well, it’s complicated. I was a lucky kid. My dad was always very supportive of non-traditional toys for girls. He never bought dolls. Instead he brought home “Construx”, “Capsela”, and other toys in blue boxes (yes, I made a motorized dinosaur for a school project). The world continued to turn. While I feel one could argue that Lego sets are largely gender neutral, Lego does have the “Friends” line that is specifically marketed to girls. The Friends themselves are shaped differently than the traditional Lego mini figures and the sets are a more gender-skewed in terms of subject matter and coloring. The Lego Friends camp, shop, and play music in a magical pink and pastel colored world. This is the direction they went with the Disney Princess sets. Cartoon Sara: My relationship with Disney licensed toys is a tough one, particularly when it comes to the merchandising juggernaut that is the Disney Princesses. I'm a longtime Disney fan and the chance to have toy representations of some of my favorite characters is one that I jump at. Or I would, if there were more that met my standards. Admittedly, I am pickier than the average six year old girl at whom these toys are aimed. But you would think that, of all the various companies that create Disney Princess products, at least one would be interested in making figures or dolls that were as screen accurate as possible. Unfortunately, capturing the look of the characters seems to take a back seat to making minimal tweaks to the Barbie mold, or having the doll light up, or making collector-aimed dolls that look very fancy, but not very accurate. The biggest case of "so close and yet so far" for me was the "Animator's Collection," a series of high end dolls based on top Disney animators' drawings of the characters...as toddlers. With Lego, my expectations were different. Lego is not in the business of making faithful figural representations of licensed characters. Instead, they translate characters into their existing mini figure style, with the classic cylindrical yellow faces, c-grip hands, and block compatible feet. That's part of the fun of licensed Lego characters: seeing how they look in the Lego style. So surely that was what we'd be getting with the Lego Disney Princesses, right? Tiny Doom: You would think so wouldn't you CS? 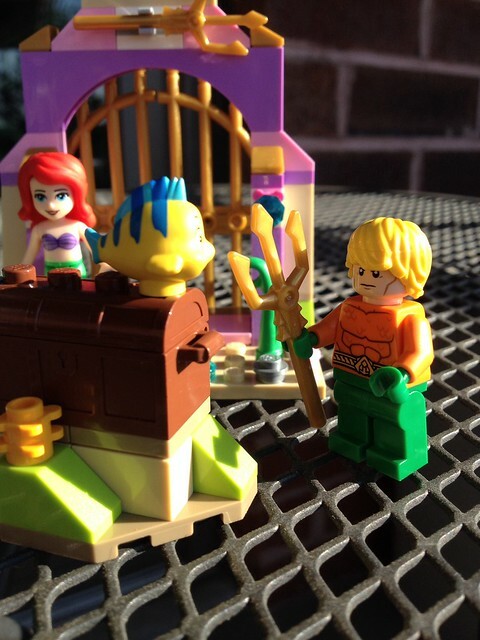 Especially since Lego mini figures do come in the mermaid and red-headed archer variety. But sadly, no, and this brings us to my first issue with these sets. This is really my issues with the Friends line in general. After all the mini-figures are a huge part of purchasing a Lego set. 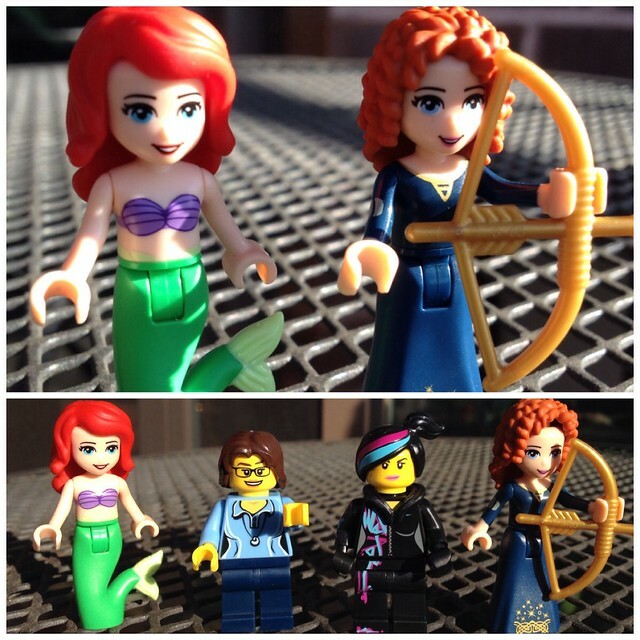 So when it comes to Lego Friends, why not a traditional mini-figure? Why the need to Barbie-ize the iconic shape of Lego Mini figures? Friends figures are thinner and taller and therefore lack the feel of a Lego mini-figure. I don’t think it’s made them any cuter, just perhaps less interesting. 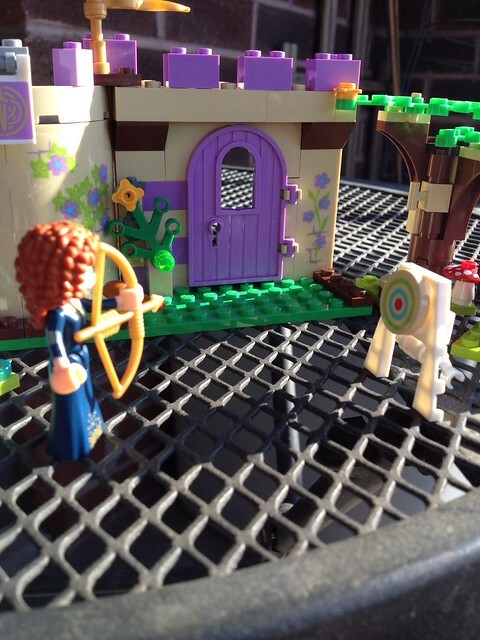 Functionally, the figures are not articulated so Merida can't hold her bow properly. The hair for these figures is also a bit more rubbery with matte-ish finish. Perhaps that is supposed to be more realistic? I can tell you one thing, it doesn't snap on to the head as well, and that’s annoying. Additionally, Ariel and Merida have the same faces. That seems a bit lazy to me, or is the message here really that Disney Princesses are that interchangeable? Cartoon Sara: The sets themselves suffer from some of the same problems as the figures. Neither one is outright bad and if all you're looking for is a set to build, you won't be disappointed. This is the classic Lego building experience with the nice, clear instructions and bricks that snap together with ease (and require the strength of a thousand weight lifters to separate), plus a newer innovation: numbered bags separating the pieces into groups. 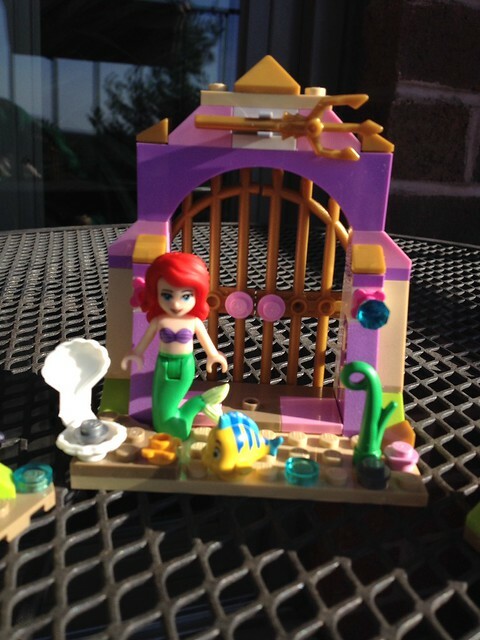 But if you're hoping for environments from the Disney Princess films faithfully replicated in brick form, you may be disappointed with Lego's offerings. In part because each princess gets only one or two sets, as opposed to the more generous offerings for movie licenses such as the Harry Potter or Star Wars films, the sets aren't so much sets for a single scene as hybrids of various parts of the films. Instead of an accurate Lego version of Ariel's grotto, we get a weird small environment with an archway and Triton's trident inexplicably mounted overhead. Merida's Highland Games fares a little better by including part of the castle and some archery targets. But it also seems to borrow from other parts of the movie by bringing in a fish on a spit and Merida's three brothers as bears. From a play standpoint, this set at least gives kids more options for what their minifigs can do in the play set. But from a Disney nerd standpoint, it's not as exciting as seeing every last detail of a classic Disney scene remade in Lego. Tiny Doom: Lego again seems to take marketing these sets to girls (really young, less discerning girls? ), a little too seriously. The color scheme for these sets is disappointing. I’m not sure why Lego feels they can’t color the sets in the Friends line in a more realistic manner. I’ve seen a few castles in my life, and none of them are pink, or lavender. Nor is Merida's castle colored this way in the Disney feature. Why pink up everything? Or add flower graffiti? The same goes for Ariel's grotto. While coral reefs do produce some amazing colors, the color scheme Lego uses here fails to capture the variety of color while still looking natural. This is of course something the film, The Little Mermaid, excels at. It would have been nice to see Lego align more closely to that palette. Little J: This should have been blue. Me: Yeah, Lego is kinda obsessed with pink for girls. Little J: Why? That's so....stereotypical! Some girls are tomboys! Tiny Doom: In the end, I didn't totally hate these sets. Some of the extras are quite cute and well done. Particularly the three bears and the pies in Merida’s set, and some of the plants and treasure in Ariel's. 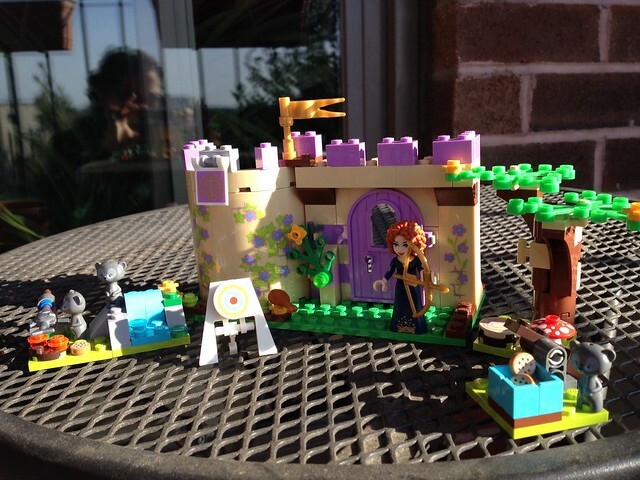 The build is pretty simple as it’s geared for ages 5-12,with Merida's castle being more complicated than Ariel's grotto. I'm willing to admit I might be extra hard on these sets since I'm not really a princess or Lego Friends fan but if this is what gets your kid (or girl, or grown-up lady) into Lego then I think they were successful. Cartoon Sara: I'm with Tiny Doom that neither of these are bad sets. They're functional Legos, they're fun to build, and they have a lot of play value. If you or someone you buy for is interested in picking one up, I wouldn't be opposed. I just think that Lego missed an opportunity to either really pay homage to these a Disney films or create a fun mashup or Disney and Lego by tying the line to the Friends brand. They're ultimately more "Friends" than they are either Lego or Disney, and they could have been so much more.